↑ "Dodo". ଇଂରାଜୀ ଉଇକିପିଡିଆ. Retrieved 29 April 2018. ↑ "Isaac Johannes Lamotius". ଇଂରାଜୀ ଉଇକିପିଡିଆ. Retrieved 5 May 2018. ↑ "Ustad Mansur". ଇଂରାଜୀ ଉଇକିପିଡିଆ. Wikipedia. Retrieved 16 May 2018. 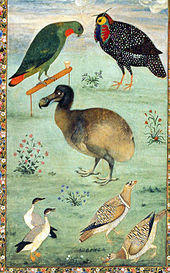 ↑ "The dodo, the deer and a 1647 voyage to Japan". Journal Historical Biology. Retrieved 16 May 2018.